Friday, August 21, 2015 was a somber night for South Jerseyans: it was Chase Utley’s first game as a Los Angeles Dodger. The sun was setting on an era, and the appropriate dive in which to spend this time for reflection and drinking was, of course, Oaklyn Manor. 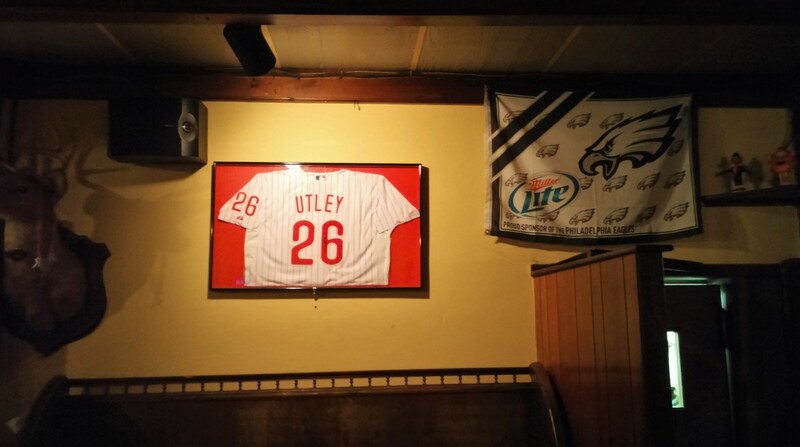 A signed jersey, one of the several odes to Chase at Oaklyn Manor. 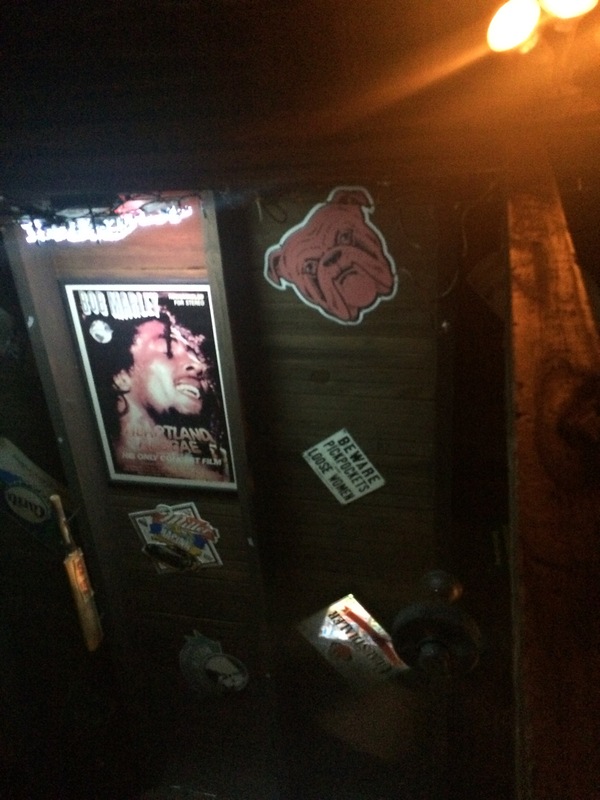 You know it’s good when they have a Red Dog sign on the ceiling. After paying my respects at the Utley shrine, we looked for seat with a view of the Dodgers game. The front bar was packed to the gills (with other Utley fans, no doubt), and the back bar was full of people playing Cards Against Humanity, so we took a seat outside. There are a couple TVs out there that you can see from the decently-sized deck. A seasoned dive waitress took our order: wings, buffalo chicken nachos, and a pitcher of Yuengling. The wings at Oaklyn Manor come dry or sauced up – and you definitely want sauce. The house blend is an amazing combo of BBQ, honey mustard, and garlic. The wings are small, but they are outstanding. Just writing this is making my mouth water for the 35¢ wings on Tuesdays. You won’t be let down by the buffalo chicken nachos either, although they could benefit from some peppers and onions to go with the buffalo chicken. 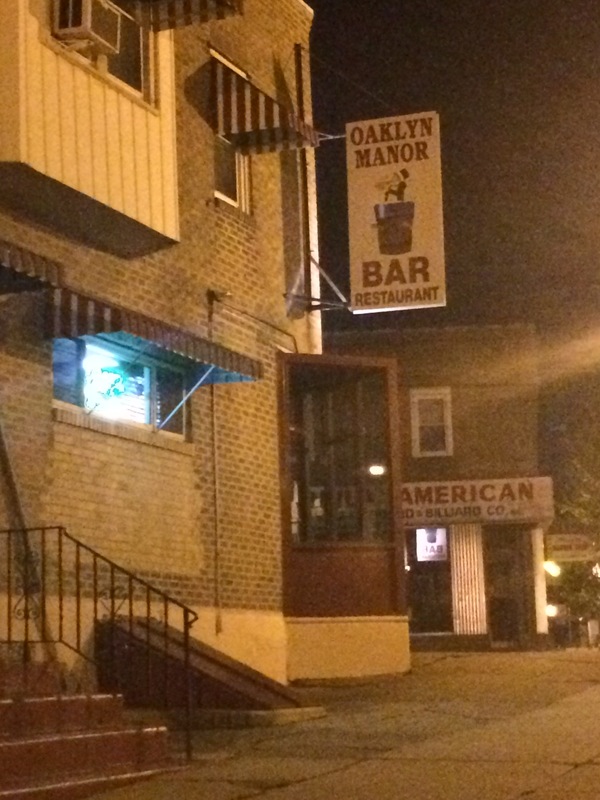 Oaklyn Manor is a classic South Jersey dive. The inside is dark, the pitchers are big, and the building is old as hell. In fact, the Manor is about as old as a bar can get around these parts; it’s been around since just after prohibition, and it’s been a divers paradise ever since. Side note: the Manor has been immortalized in fiction, in a book by local author Matthew Quick. A classic dive with killer weekday specials. Oaklyn Manor is a hidden gem. The weekly specials list is on their website too. Bottom Feeder is the brainchild of three native South Jerseyans: a brewer, a distiller, and an engineer. It was birthed through their mutual love of crushing beers in dimly lit places. Follow them as they drink their way through the area's watering holes and search for drunken treasure. Bottom Feeder's territory is expanding. Hunting for the best dive bars in and around Boston!